Boring maybe the 'summer normal', as the market consolidates the massive move. I do not see any major pullback wanting to take place, but I just do not see solid upside from here either. The charts are not giving any particular 'tell' in direction, but the 950 (on the SP500) is currently a cap. I like PBR simply because of its technical set up. It is sitting on potential light buying support, however it has a good chance of testing 40 if Oil does go to 63. I will add around 40. 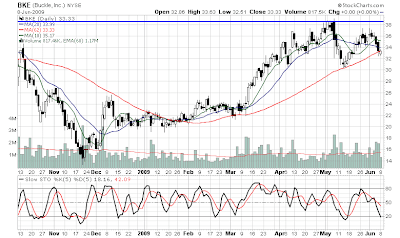 One I really like at the moment, just waiting for the markets to subside more, is BKE. If anyone is interested in retail, BKE imo, is one of the best.